The attraction to farmhouse kitchens lies in their appealing return to simplicity. But nobody is talking about bringing back the washboard. Today’s iteration of the style melds all the function and convenience of modern times with the material charm and character of a previous era. 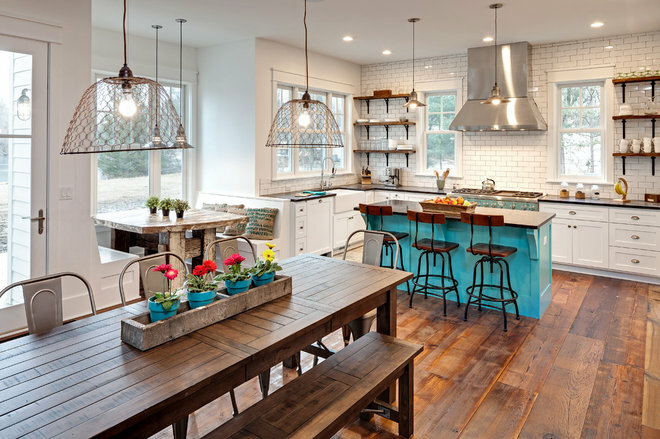 These two farmhouse kitchens strike just the right balance. 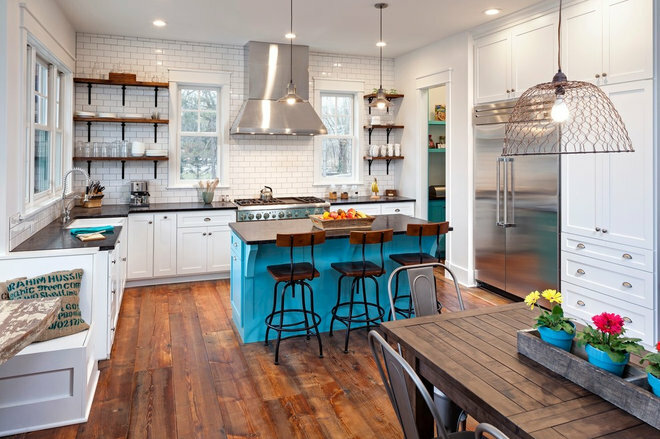 Homeowners’ request: For this custom home, the owners wanted two kitchens: one for more formal entertaining, and another scullery or prep kitchen that would allow them or caterers to do the bulk of the prepping, cooking and dishwashing away from the entertaining spaces. 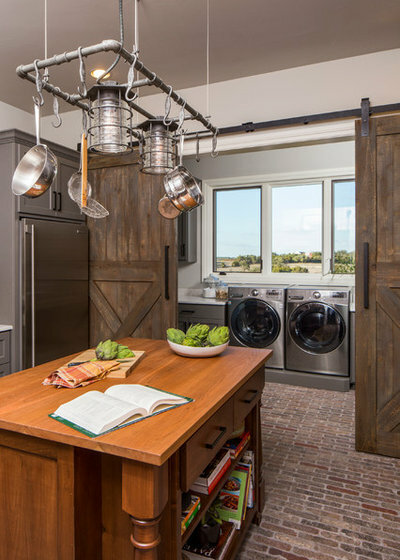 Why the design works: The kitchen opens to a utility room and entrance to the garage, making it a workhorse space for unloading groceries, cooking, cleaning and doing laundry, all out of the way from the more formal areas of the home. 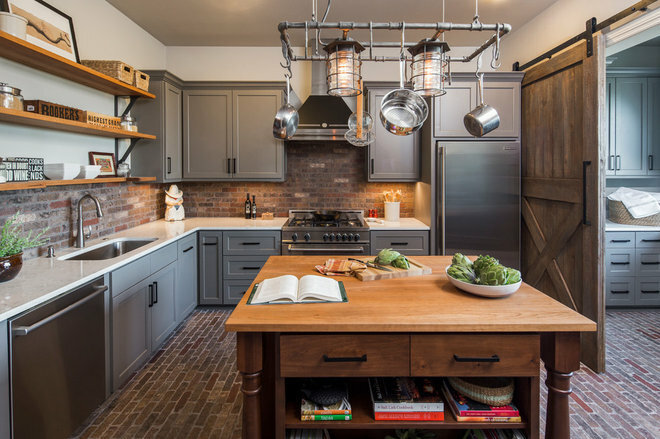 Designer secret: “The combination of clean, crisp counters and slick appliances contrasts nicely with the heavy texture of the brick floor and splash,” says designer Dawn Hearn. “I also like to combine warm and cool finishes. 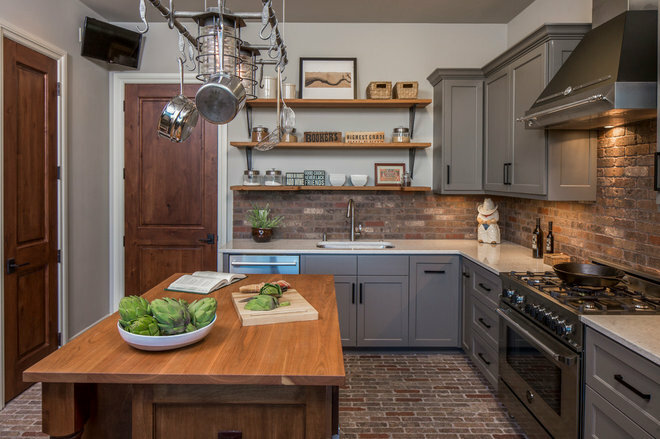 The gray walls and cabinets are a nice combination with the warm woods and earthy bricks. The blending of painted white trim, painted gray cabinets, and stained island, shelves and doors is interesting and layered. It creates more of a custom, blended look as opposed to painting or staining them all the same color.” The brick floor was sealed before grouting and then again after grouting. The installer used Aqua Mix Sealer’s Choice Gold, a natural finish with no sheen. It’s a penetrating sealer, which means it soaks into the pores of the brick and grout, rather than drying on the surface. Splurges and savings: “Although the client likes distressed cabinet finishes, we went with a simple gray painted cabinet in the prep kitchen to allow some of the painting budget to shift to other areas for custom glazes,” Hearn says. Homeowners’ request: A contemporary farmhouse with a bright, airy space and an open layout with views to the lake. Also, open shelves with white trim, cabinets, tile and walls. Why the design works: The rustic patina of the old barn wood floors makes them easy to take care of. The open layout to the great room is great for entertaining and keeping an eye on the rest of the family while working in the kitchen. Who uses it: This is a rural summer lake house designed for a private equity consultant and a physical therapist with three young boys. The family lives near Wrigley Field in Chicago. Dining table and bench: Cost Plus World Market; dining chairs and stools: Restoration Hardware; sink: fireclay butler, reversible apron; faucet: Ikea; countertops: granite, Matrix; wall paint: Dover White, Sherwin-Williams; chicken wire lights: Barn Light Lighting Co.
“Uh-oh” moment: The appliance supplier accidentally ordered the wrong range hood. Between the time the installer measured for a new one and ordered it, the contractors tiled the entire kitchen wall. When the installer went to put in the range hood, it no longer fit because of the installed tile. The homeowners were told that they would have to rip out the subway tile on the wall to get the hood in. But the builder and his team were able to tweak the hood and get it installed without removing the tile. Splurges and savings: Going with upper cabinets saved the couple money to put toward their dream 48-inch Wolf range. Meanwhile, a big walk-in pantry ended up being more economical than adding more cabinets for storage.